John Kenneth Muir's Reflections on Cult Movies and Classic TV: Ten Years of JKM Reflections: Navarone Playset! 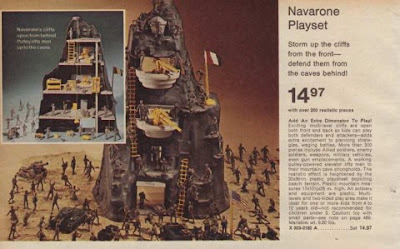 This look back at the Navarone Playset was originally featured on the blog August 1, 2012, and garnered several thousand hits...meaning that a lot of grown-ups remember playing with this particular toy as children. Apparently, his toy was “loosely” (meaning unofficially…) related to Alistair Maclean’s 1957 novel The Guns of Navarone, which concerned a team of Allied soldiers launching an assault on a German fortress on the (fictional) Greek island of Navarone. The novel was adapted to film as “the Greatest High Adventure Ever Filmed!” in 1961, by director J. Lee Thompson. It was a huge hit, and spawned both a written and filmed sequel, Force 10 from Navarone. The 1978 movie starred Harrison Ford and was directed by Guy Hamilton. 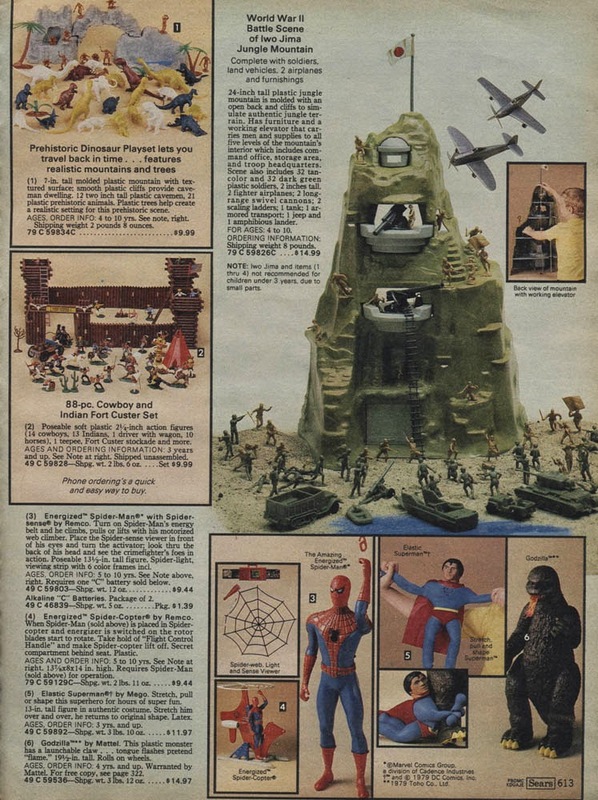 In real life, there was no Battle of Navarone, but that inconvenient fact did not prevent Marx Toy Company, in 1976, from producing this multi-level mountain fortress, replete with two armies. As you can see from the graphic, it originally sold for under $15.00 dollars. The version of the toy I own today, however, is not from Marx at all, but rather from Mego. Thus I can only assume that Marx sold the Navarone Playset mold at some point between 1976 and 1980. When I was a kid, I’m pretty certain I owned the original Marx version, and not the Mego re-do. This molded-in-black Navarone (from Mego) is for my son, Joel. Honestly, as a kid I didn’t want to relive the past with this awesome mountain playset. Instead, I utilized Navarone as a base for the Galactic Empire with my Kenner Star Wars figures. In fact, I remember having a number of great adventures with Navarone but almost universally in a sci-fi setting. I remember one particular adventure in which the crew of the Enterprise (Mego; 1979) had to go behind enemy line -- the Romulan Neutral Zone -- and destroy the base.